There’s more than one way to get to Vernonia – if you don’t mind getting dirty. This post is sponsored by River City Bicycles. You know I have a soft-spot for Columbia County. 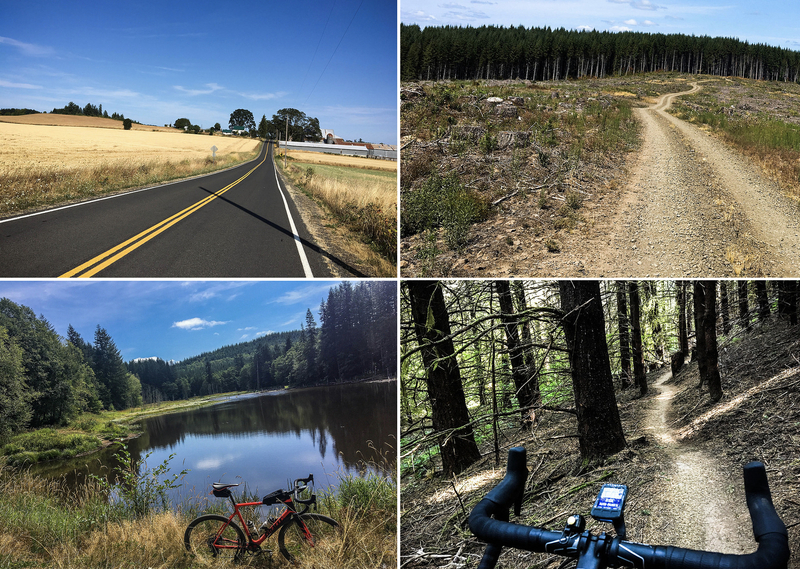 A ride I did this weekend made it even softer: A 100-mile loop that pulls together adventurous riding that’s relatively close to Portland and offers everything from expertly crafted singletrack and primitive logging roads to carfree paths and smooth country roads. I call it the Scappoose Vernonia Singletrack Century. The Timber Logjam ride is a symbol of modern adventure cycling culture. Without formal organization or promotion, word of the ride spread through social media. 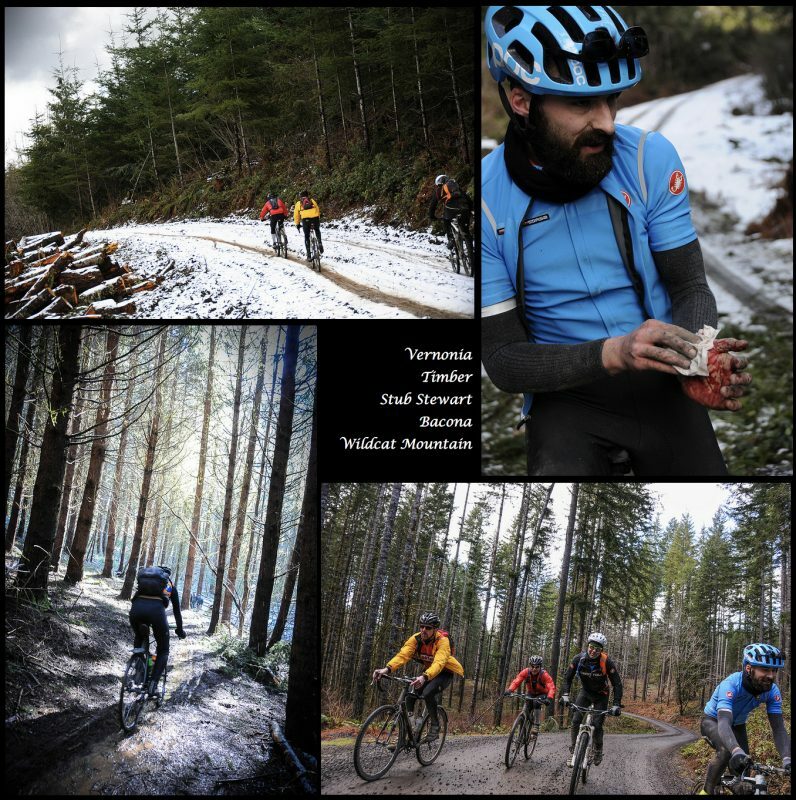 And by Saturday, as welcome sun beat down through frigid air on the Banks trailhead of the Banks-Vernonia State Trail, about 70 people were on their bikes and ready to ride. A new century ride will bring more people to roads like these in Columbia County. With a new event ride and an outdoor events park that will host mountain bike races this summer, Columbia County is quickly starting to fulfill its vast potential as a bicycle recreation destination. The logging roads northwest of Vernonia are spectacular, but not all of them are open to public access. Several weeks ago a group of bicycle riders ran into a security guard while riding dirt roads outside of Vernonia. The incident shows that Weyerhaeuser Columbia Timberlands is actively enforcing the new permit program they launched back in July. It has also set off an effort by Columbia County Parks to create new signage that clarifies which roads the public is still free to use without a permit. Glen Crinklaw glances at the view from the crest of Clatskanie Mountain Road between Mist and Clatskanie. 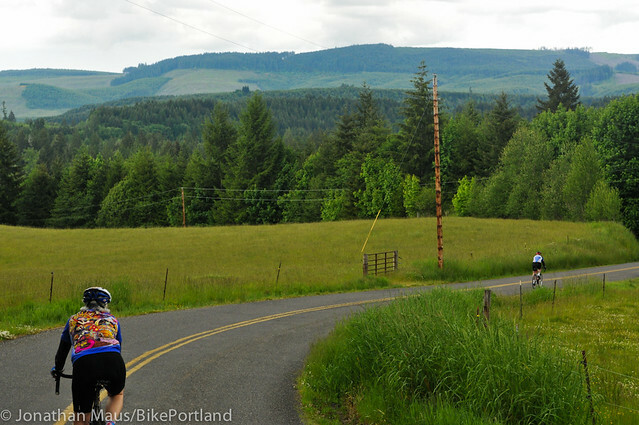 There’s much more to riding in Columbia County than the marquee Banks-Vernonia Trail and Highway 30. 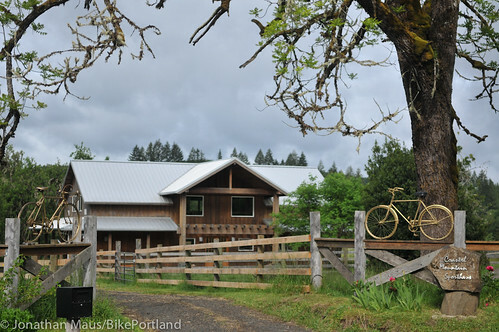 Nestled between the forest and the Nehalem River, the Coastal Mountain Sport Haus awaits bike-loving guests. One of the best things about bicycling in Portland isn’t even in Portland. It’s a small town called Vernonia. 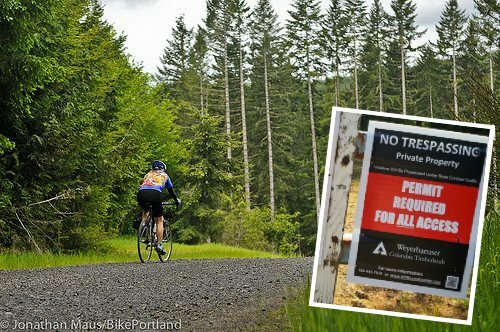 Situated a perfect day’s ride from Portland (about 50 miles, or less if you take MAX to HIllsboro), Vernonia is nestled in the woods at the end of about 20 miles of the smoothly paved Banks-Vernonia Trail. 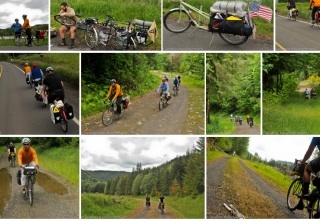 This past weekend I packed up a few panniers and joined some friends for an overnight bike ride out to Vernonia. On the way out we rode through some great new trails and rural backroads through Washington County; and on the way back, we opted for logging roads and dirt trails that led us to Scappoose. Even under grey and wet skies all day Saturday, it was fantastic riding. But what made this weekend so great wasn’t just the pedaling and the good company, it was the town of Vernonia itself. From the easy and comfortable camping at Anderson Park, to the hospitality of locals we experienced at Black Bear Coffee and the Cedar Side Inn. Vernonia poised to become "Velo-nia"
Trail advocate and planner Ric Balfour is spearheading an effort to transform the small town of Vernonia (about 45 miles west of Portland) into a cycling paradise. The town already boasts the popular Banks-Vernonia Trail, a 20 mile Oregon State Parks trail between the towns of Banks and Vernonia, but Balfour sees much more potential and he’s working hard to create enthusiasm for bikes among the town’s 2,300 residents.